Adobo has always been a house staple in every Filipino home. But what would happen if an Indonesian wife prepares an Adobo recipe and adds a dash of Indonesian spices for her family? That’s how Babi Kekap was formulated. Lucy and her husband Gershwin have joined several food competitions and are very proud of winning the major prizes in most of these events. Would their latest recipe, Babi Kekap, make them winners of the Adobo Challenge 2016? Pork Adobong Laing Pinangat – that’s two of the famous Filipino favorites, adobo and laing, combined in one extraordinary dish. Dayrit’s 40 years of experience in creating sumptuous heritage home-cooked meals is very evident with their entry for The Adobo Challenge 2016. When it comes to grilling and roasting, Cuisiniers is definitely a go-to Mercato Centrale food vendor. For the Adobo Challenge 2016, Chefs Raymond Fabre and Rapheray Co introduce the pride of Makinabang, Baliuag , Bulacan - the Crispy Beef Adobo. The Makinabang beef is carefeully flavored and cooked until perfectly tender. It is then deep-fried until the meat becomes crispy. 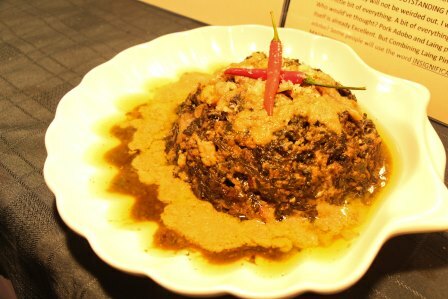 Their entry is a unique recipe from Central Luzon made more special with its two-stage cooking process - braising and frying. Cuisiniers being a pioneer food concessionaire at Mercato Centrale has been featured in several magazines and TV documentaries. There’s no doubt that this newly created adobo recipe with a twist will become another favorite in their menu. Nothing beats home-cooked style food. This is definitely one of the main reasons why Dadding’s Kitchenette has become a popular Filipino Restaurant in Laguna. With a desire to bring their tradition of serving affordable yet great tasting food outside their hometown, the owners of Dadding’s ventured to bringing their home-cooked dishes to the residents of Metro Manila and Mercato Centrale. For the Adobo Challenge 2016, Dadding’s Kitchenette cooks up “Adobong Ensalada”, a mix of adobo flakes topped with salted eggs and mangoes wrapped in banana leaves. This flavorful mix can serve as a meal starter, a viand, a stand-alone snack, or even as pulutan. Their variation may seem very simple but Dadding’s assures food lovers that the taste of authentic Filipino adobo explodes with every bite. The Hairstylist’s Menu maybe a newbie in Mercato but it already has a steady following because of its tasty offerings in their menu. The “Four-Way Cooked Chicken Adobo in a Pouch” is Leo Pascual’s bold entry to the Adobo Challenge 2016. It is prepared by boiling shredded chicken in coconut milk then cooking it the adobo way, that is, in garlic, soy sauce and vinegar. Small portions of the mixture is then placed inside lumpia wrappers to form small pouches and deep fried until golden brown. These little adobo pouches are served with three different vinegar-based dips. Leo believes that what makes his recipe unique is the complex procedures involved in its preparation. He draws inspiration from his mother’s very own version of the ‘wrapped adobo’ and added his own expert ideas in cooking. Filipinos are certified food lovers. From home-cooked meals like adobo to fast food chain staples like hamburgers, Filipinos are sure to be loyal patrons of something that’s delicious. With this in mind, Hunger Buster, one of the most popular burger chains in Mercato Centrale thought of marrying a classic Pinoy favorite that is adobo and a classic American food that is hamburger. The Adoburger is Hunger Buster’s entry to this years Adobo Challenge. Flavorful ground beef marinated in adobo sauce makes up the yummy patty. It is fried until golden brown and then topped with sunny- side up egg and kiwi. Talk about East meets West! If there’s one thing that Hunger Buster owners attest to, it is the fact that Filipinos love to experiment on food that will both intrigue their palate and satisfy their distinctive taste. When we speak of pulled pork recipe, The Oinkery of Mercato Centrale BGC is absolutely a must-try. But how does Pugon-Smoked Pork Adobo sound to food lovers out there? Matthew See didn’t think twice when he decided to join The Adobo Challenge 2016. He knew that he can easily reinvent this Filipino favorite into a version that will leave foodies craving for more. Nueva Ecijano Chef Francis “Bab” Basa is well-known for his sisig dishes at Mercato Centrale and so it comes as no surprise that his entry to the Adobo Challenge 2016 is a fusion of adobo and sisig that also boasts of his culinary heritage. Named Beef Adobo a la Cabiao, the sisig-style beef adobo is meticulously wrapped in an omelette before it is served, a food preparation traditionally done in Nueva Ecija. The rich taste of crispy meat complements the soft omelette wrapper making this adobo dish a standout recipe. Chef Bab introduces native dishes from Central Luzon to Metro Manila so that more people, especially the young generation can get a taste of this region’s gastronomic specialties. 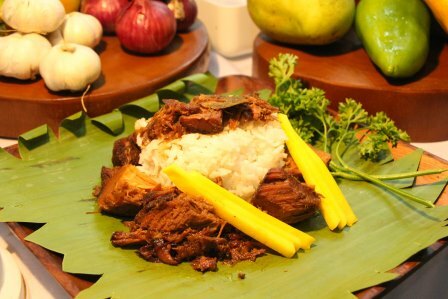 For the Adobo Challenge 2016, Timplador Lechon House presents the Pork Humba. 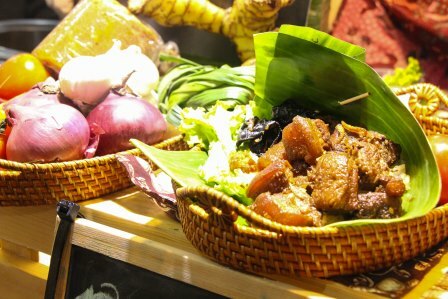 Humba is another well-known recipe in the Philippines and resembles the Chinese dish called hong-ba. As Timapladoe Lechon owner Celestino Malalo-oy, relays, the Pinoy version of humba is cooked like adobo using soy sauce, garlic and vinegar but since this recipe is famouos in the southern part of the Philippines, pineapple juice, pineapple tidbits and black beans are added. The result, a fusion of sweet, sour and salty flavors that is sure to whet anyone’s appetite. According to Timplador’s main man, his Pork Humba goes very well with steamed rice that is why Filipinos (who are rice-eaters) will definitely love this classic recipe. Good Meal Hunting’s Adobo Challenge 2016 entry is certainly as interesting as their business name. The Korean husband and Filipina wife tandem decides to reinvent adobo by the fusion of their respective culinary heritages to give birth to Fried Chicken Adobo on Fire. Tina loves to cook and eat adobo, a Filipino but her Korean husband doesn’t want the oily and salty version so Tina decides to infuse Korean flavors into her Adobo recipe. She deep-fries marinated chicken fillet then mixes it with traditional adobo sauce with some Korean spices giving it the hot and spicy taste that Tina’s husband is looking for. Good Meal Hunting’s Fried Chicken Adobo on Fire is absolutely another interesting twist to the adobo that Filipinos love. As they say, there’s nothing more nutritious and more delicious than a home-cooked meal. This inspired Vernie of Good Meal Hunting Halal to join the Adobo Challenge 2016 and serve his Classic Chicken Adobo. After being exposed to a community of food lovers and cooking enthusiasts, Vernie decides that he is ready to recreate a winning adobo recipe. The blended flavors of chicken, soy sauce, vinegar, garlic, onion, and seasoning, all prepared and cooked “halal” make this classic adobo recipe truly mouthwatering. Good Meal Hunting Halal’s Classic Chicken Adobo recipe may not be as intriguing as the other entries but its simple and comforting taste will surely make everyone feel at home. What happens when the Filipino–signature dish Pork Adobo is wrapped in edge-crimped thin dough steamed and then pan-fried? Enter: Clear Fat Ninja Adobo Gyoza! Among the fresh faces in Mercato Centrale, Stephen Tan and Vincent Rocha of Fat Ninja Gyoza turn the traditional adobo into a Japanese side dish for the Adobo Challenge 2016. Their “adobofied” gyoza is soft and chewy on top and fried to perfection underneath. The owners make use of shredded leftover adobo, adds some Japanese spices then stuffed the mixture into rolled dough. To add flavor, they top the dumplings with blow-torch-melted cheese. Their own version of tare sauce completes the taste of this unique recreation of the Filipino adobo. Adobo sa Puti is a variation of the classic adobo. In this version, the soy sauce as the salting agent is replaced with the tasty fish sauce or patis, giving it a lighter color. This is House of Crispy’s delicious entry to this year’s Adobo Challeng. Their choice is inspired by their desire to promote this particular style of cooking adobo that hails from the Visayas region. House of Crispy at Mercato Centrale is famous for their fried seafood dishes which include the blockbuster crispy crablets and crispy shrimp. The addition of Adobo sa Puti in their menu gives variety to their food offerings and shows their expertise in preparing great Pinoy dishes. Lariza’s, another well-known food vendor in Mercato Centrale shares their expertise in creating a unique dish for the Adobo Challenge 2016. 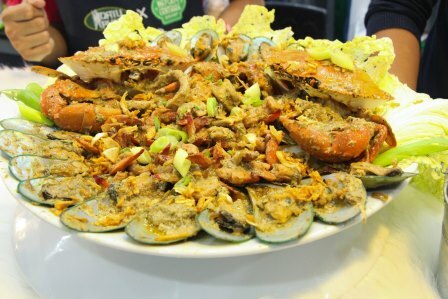 Sure, we’ve heard about seafood kaldereta or seafood kare-kare but for this year’s competition sponsored by Datu Puti, Inc., Lariza’s presents their very own “Seafood Adobo”.